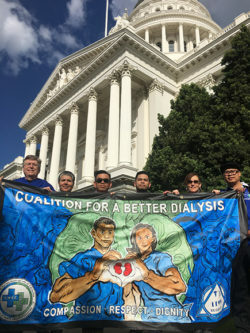 The California State Senate’s Health Committee stood with dialysis caregivers yesterday by their decisive vote in favor of the Dialysis Patient Safety Act (SB 349), which would set safe caregiver-to-patient ratios in chronic dialysis clinics statewide, mandate safer transition times between patients for infection control, and require annual inspections of the facilities. State Senator Ricardo Lara introduced the bill in February and presented it yesterday to the committee chaired by State Senator Dr. Ed Hernandez. 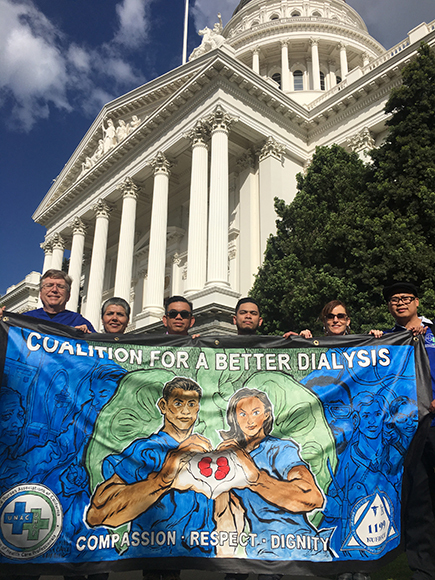 The bill calls for ratios in California’s chronic dialysis clinics of no more than 1 RN to 8 patients, 1 tech to 3 patients and 1 social worker to 25 patients. Dialysis clinics have become a multi-billion-dollar industry, with around 650 such clinics in the state. More than 63,000 Californians depend on dialysis treatments several times weekly to stay alive. The bill will now move on to the Senate Judiciary Committee for a hearing expected next week.